Got a phone call several days ago from a young man by the name of Tony Ryu. Tony had used WARMSHOWERS.COM to contact me to see if he could spend the night. Of course I said yes. He was coming from the Hagerstown area on this particular day of his trip and his GPS had sent him on a crazy route through the lowland area between us and Hagerstown. Tony, who has had limited biking experience and was unaware of the mountain that stood between him and his final destination was a tad bit weary when I picked him up at the junction of 522 and 127. His initial plan was to ride down Route 50, but, when I told him the mountains he had just transversed were baby mountains in comparison to the mountain west of us, he let out a mournful sigh. When he first called I suggested that he use the C&O canal to avoid the cars and hills but he decided to trust the GPS. Chalk one up for me! Like most of our guests, Tony was a fountain of youth and exuberance once he recovered from his dehydration. I told him he could spend an additional day if he choses to and he accepted the offer. Our timing was perfect and allowed us to watch the WORLD SOCCER game between South Korea and Germany, Korea won 2-1. It was a great game! In our time together I learned that Tony was in a masters program at Columbia University of finance, but was not really sure what he wanted to do with his life. I believe his time in America was altering his views of the world in what I would consider a positive way. He has one more year of school. I think he is a little concerned about what he is going to do when he completes his degree. 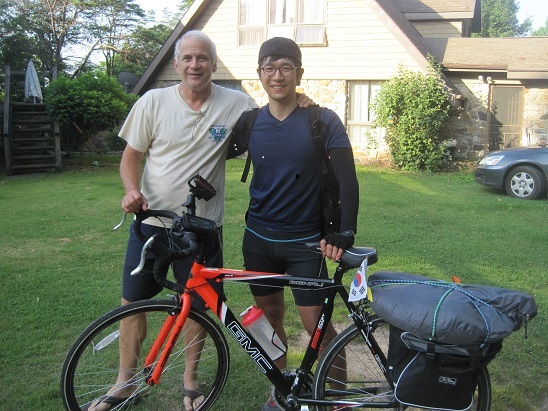 He decide to bike across the US in remembrance of the 200 students who died when a ferry sank back in his home country, Korea. Just before he left, he asked if he could tie a yellow ribbon around a tree as a tribute to those fallen students. This morning, Tony headed off to Cumberland to catch the Great Allegheny Passage(GAP) to ride to Pittsburgh avoiding the killer mountains and traffic that would have awaited him, had he taken route 50. I talked to him this evening after he arrived in Cumberland where a Mormon church gave him permission to camp on their grounds. Tomorrow he will continue his journey on the GAP on his way to Pittsburgh. You can follow Tony’s adventures on his facebook page. I just listened to author, Phillip K. Howard and I am not sure the word ‘inspired’ is correct but he has dug deep into my soul and fired up a nerve. Mr. Howard has written a book called THE RULE OF NOBODY and I have to say he hit the proverbial nail squarely on the head! His premise is simple, from our desire to have a better world with less chaos and human error we have ‘ruled’ ourselves into oblivion. No longer do we rely on human intuition to solve a problem but we must go to the RULE BOOK to find a solution. In my thirty years of teaching, I can not count the number of times I have said to limit the number of rules in a school. The idea of creating rules that cover every possible scenario that can happen in a school is beyond insanity! Students in their quest to be creative study the handbook and try to come up with things to do that are not covered by the rule book. This generates wild and crazy scenarios. The student, having been caught doing something that appears to be off-the-wall defends himself with “It not in the rule book.” Lawyers then step in with, “If it’s not in the rule book, how can you punish him, he did not know it was wrong.” The perpetrator sits smiling as this ridicules situation plays out to its inevitable end. This is where the person in charge needs to say the hell with the rule book; this action is wrong and should not be a part of the school environment! This crazy situation is not isolated to the schools, but exist in every part of our society. Our leaders think that they can keep creating rules until they have fixed every conceivable problem. Our elected officials have been writing rules for over 200 years and they will continue to write more rules every year. The idea that we can be ruled by laws rather than people is scary! Sure, there should be some clear cute guidelines that we can adhere to, like the Constitution, but there has to be some real common sense leading the way. This is where we have lost our way. Now, take this idea to the next logical step. If we can create a rule for every possible stupid thing that we can do, why not let artificial intelligence take over. We do not need people to litigate and enforce laws written in stone! If we can write the perfect program and every possible infraction is written down, why can’t a laptop decide our fate? As our society gets dumber and dumber and less able to govern ourselves, computers will need to take over so that we do not let the power plant fail and turn them off. It would be like a survival thing for the software. So in the end, we may look to science fiction for the fate of civilization. There are many examples of computers conquering man, the BORG from start trek is one of my favorite examples, the MATRIX is another and probably my most favorite is the animation, WALLY which depicts a society that lets the computers take over completely. Now here are some strange laws to keep you laughing. I found these online so they may be not true, but I doubt it. What happened to black wire clothes hangers? I took some shirts to the closet to hang up and it struck me of all the wonderful colors of the cloth-hangers. There was a rainbow of colors that was delightful to the eye. Several years ago my wife decided that she wanted the new colored plastic hangers rather than the old wire hangers. Over a period of a year we discarded all the old hangers and replaced them with the new colorful hangers. Before long she also decided that the different colors represented different things. The white hangers stayed in the laundry room and the blue hangers were for her clothes, the red hangers were for my clothes. 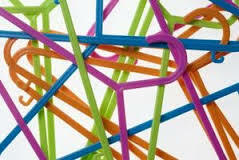 Suddenly, what was simply an addition of color to my life became an obsession with colored hangers! How was I supposed to remember which color was for what thing? So then the arguments began because I used the wrong hanger for a certain piece of clothing. I think this hanger-crisis has passed because the hangers are now scattered all over regardless of their color. A small victory for sanity! Initially I thought this was an isolated incident but then the mobile phone became an issue. There are four phones in the system and they are all compatible with all the charging cradles. In other words they all can sit on any cradle at any time and it makes no difference. My wife convinced me, in one of my weaker moment, that it did matter because all the phones had to be in specific cradles. I found a stick-on-label packet which allows us to label each phone with a name that identified where that particular phone belonged. At the time this seemed like a good idea but slowly turned into a constant struggle to keep the right phone in the right cradle. After a while I changed the ringers so that each phone had a specific ring allowing us to determine which phone was near us when they rang. This turned into an additional nightmare since we could not remember which phone had which ring. Our lives are quite complex. We have so many things to remember that if one takes the time to think about all of them at one time, it affects ones balance. Just think of the deluge of issues that may occupy your mind in one short day. Car inspection, car taxes, car tags, car maintenance, house taxes, house maintenance, dentist appointments, doctor appointments, balancing your personal budget, paying bills on time, birthdays, anniversaries, kids, kids grades, kids friends, parties and the list goes on and on. Each one of these in its own right could push us over the edge! So, in regards to the clothes hangers or the stupid phones, how could it be important which hanger you use to hag you clothes and who gives a crap which cradle the phones are on?! WHY DO WE HAVE THE NEED TO MAKE EVERYTHING MORE AND MORE COMPLEX!!!! The KISS principal is becoming a more important mantra for me all the time. KEEP IT SIMPLE STUPID! Now, if I could just find a blue hanger for my dress shirt….